How did I get varicose veins? Healthy leg veins contain valves that open and close to assist in the return of blood back to the heart. These one-way valves close to prevent the blood from leaking back down the leg. Venous reflux disease develops when these valves become damaged or diseased. As a result, vein valves will not close properly causing oxygen-poor blood to fall back down into the legs. Blood pooling in the damaged veins causes vein dilation. Eventually, these veins start to look like your typical tortuous, ropy and unsightly varicose veins. Other complications and symptoms can include thrombosis (clot), throbbing, or bleeding. The inability to clear the blood within the legs can impair exercise tolerance and produce restless legs at night that ache. As venous disease progresses, diminished blood flow can produce inflammation in the soft tissues causing edema (swelling), aching, fibrosis, and eventual tissue breakdown, resulting in leg ulcers in severe cases. This disease process has been called by many names including “venous insufficiency”, “varicose vein disease” and “venous reflux”. How common is venous disease? Very common! It is estimated that more than 30 million Americans suffer from disease of the veins. About 50-55% of women and 40-45% of men suffer from some form of vein problem. Varicose veins affects 1 out of every 2 people older than the age of 50. If you have been hiding your legs because of how they look or feel, you are certainly not alone. What are the risk factors for venous disease? An important factor—venous insufficiency tends to run in families. This is likely related to some weakness of the vein walls or valves. Pregnancy is often a triggering event for varicose veins—a combination of increase vascular volumes, increased central venous pressure from the weight of the uterus pressing on the central veins, and generalized increased tendency to clot can cause the first failure of the valves that progresses over the years to come. This can damage valves, and can also set in motion a long-term cycle of valve dysfunction that produces increasingly severe venous disease over time. The risk of varicose veins increases with age. Aging causes wear and tear on the valves in your veins that help regulate blood flow. 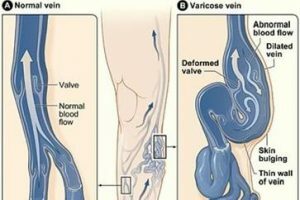 Eventually, that wear causes the valves to allow some backward blood to flow in your leg veins where it collects instead of flowing up to your heart. Being overweight puts added pressure on your leg veins. Similar to pregnancy, the central veins of the abdomen and pelvis can be become restricted and malfunction over time. Your blood doesn’t flow as well when you’re in the same position for long periods of time. Walking or running causes your calves to squeeze the veins and force blood to flow in the correct direction. Women are more likely to develop the condition. Hormonal changes during pregnancy, pre-menstruation or menopause may be a factor. Female hormones tend to relax vein walls. Taking hormone replacement therapy or birth control pills may also increase your risk of varicose veins. Though no single factor can be directly attributed to this gender predilection, there is certainly a statistical difference between men and women. When Should I Seek Medical Treatment? Self-help measures (conservative therapy and change in life style habits) can help ease some symptoms of venous disease and may prevent the process from worsening. However, if the way they look and feel becomes a concern, their presence interferes with your lifestyle or work, or self-help measures are not successful, then it’s time to see one of our physicians. We can provide prescription conservative therapy or help you select the procedure that’s right for you. When you need experienced advice, call us at 215-416-9534.